November 2, 2018 7:30 – 9 p.m. 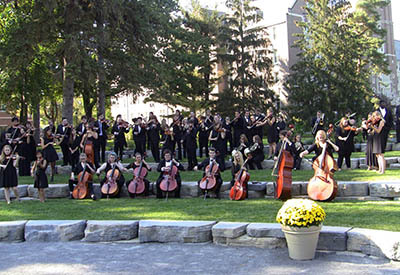 The Nazareth College Symphony Orchestra performs Bernstein’s Symphonic Dances from West Side Story, Mozart’s Violin Concerto and Debussy’s Danse sacrée et danse profane. This concert will be live-streamed. Fine to Fashion Sale for Alternative Break 7:30 a.m. – 5 p.m.
Catholic Mass 12:30 – 1 p.m.
Environmental Sustainability Club Meetings 3 – 4 p.m.